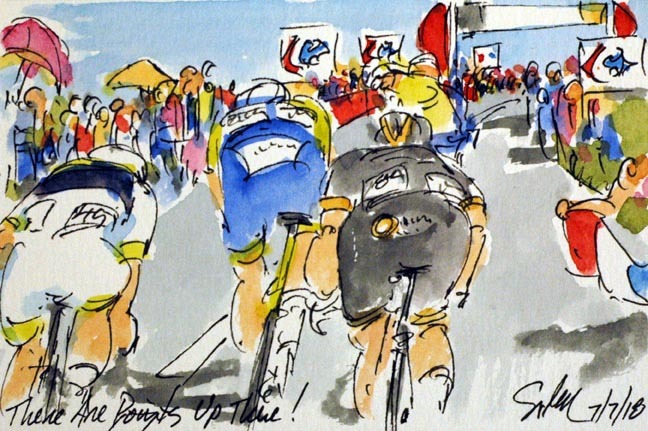 The Art of Cycling: Tour, Stage 1: There Are Points Up There! Tour, Stage 1: There Are Points Up There! While these three could not have hoped to hold of the peloton all of the way to the line, they did stay away long enough to contend for the only King of the Mountain points on the first stage of the Tour. All three gave it a go, but it was Kevin Ledanois (Fortuneo-Samsic) who claimed the first Polka Dot Jersey of the 105th Tour de France. His companions, Yoann Offredo (Wanty-Groupe Gobert) and Jerome Cousin (Direct Energie) will have to console themselves with TV time for themselves and their sponsors. Ledanois was later awarded the first Most Combative rider of this Tour. The Cote de Vix was not much of a climb, but the organizers wanted to get someone in to polka dots for the next day of racing. The balance of the jerseys will be fought for in another 80 kilometers in Fontenaye le Comte.